Lake County’s written history began when French traders and missionaries traveling through the region noted the place in their journals. In 1673, Father Jacques Marquette referred to the Des Plaines River as “the river of portage” and wrote of its tendency to flood its banks. This characteristic seems to be how the river got its name, as an 18th cartographer named it “Plein” for its high water. The French “eau pleine”, meaning full of water, evolved into Au Plaine, Aux Plaine, O’Plain, and finally Des Plaines. 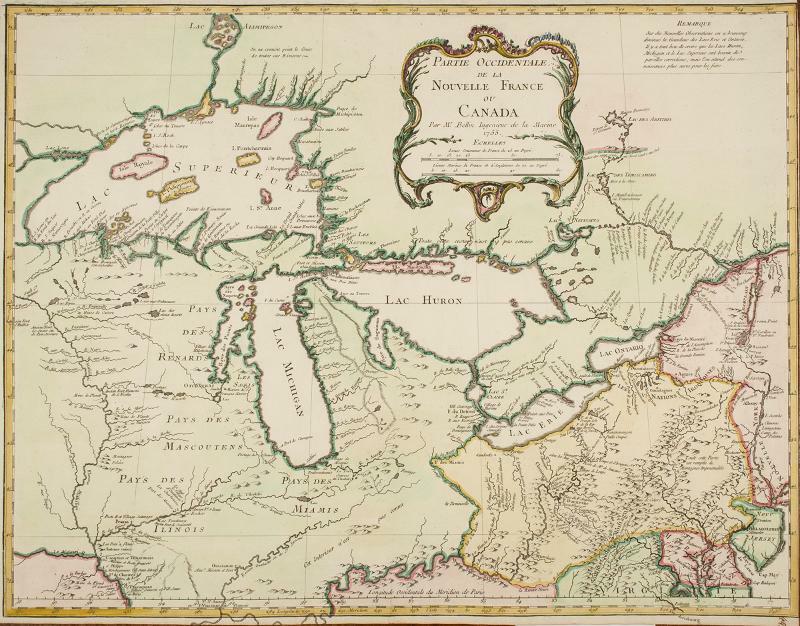 Jacques-Nicolas Bellin’s Partie occidentale de la Nouvelle France ou Canada (Pars, 1755). William L. Clements Library, http://archive.constantcontact.com/fs116/1103480314797/archive/1110560269463.html. Although trading posts and military forts had been scattered throughout the region since 1695, non-native settlement really grew following the Treaty of Chicago in 1833 which essentially gave the entire area of Illinois to the U.S. Government. In this treaty, signed between with the United Nation of Chippewa, Ottawa and Potawatomi Indians, the tribes relinquished their last tracts of Great Lakes land, and the land was opened to permanent settlement. Though the land would not be officially surveyed and available for purchase until 1839-1840, that didn’t stop some hardy souls from making their way west and north. As settlers moved into the area, the Des Plaines River was a natural path to follow. The native people of the area had used the Des Plaines River as a travel route for ages. The red line on this circa 1830 map (above) of the Boundary Line between ceded and unceded lands runs along an early Indian trading route marked “Trace to Milwalky and Green Bay.” Settlers arriving in Chicago could follow this trail northwest, up on the high land above the Des Plaines River. Within a few years of the first settlers, this trail would be established as the Milwaukee Road, known today, with a few minor changes, as Milwaukee Avenue. We will also follow the river north as we profile a few of those early settlers and mark the progress of settlement up the Des Plaines River. This map, drawn by a member of the Libertyville-Mundelein Historical Society in the 1970s, will serve as our guide. Daniel Wright (1778-1873) is considered to be Lake County’s first permanent non-native settler. Wright was born in Rutland, Vermont in 1778. He was a farmer and served in the War of 1812. Although he was known as “Captain” he served in the war as a Lieutenant with the 1st Rifle Company, 3rd Regiment of the Vermont Militia. In 1814, he moved with his family to Ohio. In 1832, talk of good farm land in Illinois led Wright to Fort Dearborn (later known as Chicago) where trappers told him of good hunting along the Des Plaines River south of what would become Half Day. He built a cabin on the west side of the river at about the spot where today’s Aptakisic Road would intersect with the Des Plaines if it continued east through the Par King parking lot. The exact date of Wright’s arrival is not clear. Though many of the county’s history books note that Wright arrived in 1834, in a letter to the Waukegan Weekly Gazette in 1868, Wright stated that “the native tribe of Potawatomi… helped me raise my first rude log cabin in June 1833.” If that is true, this puts Wright’s arrival prior to the signing of the Treaty of Chicago. Wright never purchased the land he settled on, but his grandson, William Whigham, did. Late in life, Wright lived with his grandson on the southwest corner of Milwaukee Avenue and Aptakisic Road until his death in 1873. Other settlers began to trickle in, one of them being Hiram Kennicott (1810-1880) who became Daniel Wright’s “neighbor” in 1834. A lawyer from New York, Kennicott built a cabin a little farther north near present day Half Day, near the mouth of Indian Creek. He established the first store, mostly offering food and tools for pioneers journeying north. In 1835, he established the area’s first saw mill and later utilized the river to run a gristmill, though in this case he was second to Jacob Miller’s gristmill built on Mill Creek in 1835. Kennicott also ran a blacksmith’s shop and a tailoring business. In addition to his commercial enterprises, Kennicott served as the county’s first justice of the peace, heard the first lawsuit in the county, and performed the first marriage – Daniel Wright’s daughter, Caroline, to William Wigham (Sr.). At some point in the late 1840’s, Kennicott established a farm in the Buffalo Grove area, but lost it during a financial panic. He moved to New Orleans, commenced the practice of law, and soon regained his fortune. After a few years he returned to Cook County and bought land about 3 miles west of the river near today’s Arlington Race Track. There he ran a dairy farm of 1000 acres referred to as “The Folley.” Eventually he followed some of his children to Colorado where he lived until his passing in 1880. His brother, Dr. John Kennicott, was a pioneer in the Glenview area. His 1856 home is today part of The Grove National Historic Landmark maintained by the Glenview Park District. If we follow the Milwaukee Road a little farther north to about where the Cuneo Mansion/ Elgin, Joliet & Eastern railroad crossing is today, we find the claim of brothers, Ransom (1798-1862) & Richard Steele (1802 -1876). From Portrait and Biographical Album of Lake County, Illinois, 1891. Ransom Steele was born in Waterbury, CT in 1798. Ransom was engaged in the woolen manufacturing business before deciding to seek a home in the “far West” and become a farmer. He set out for Illinois in 1834 to join his brother Richard who had come out the year before. They made acquaintance with Andrew Wells near Naperville where they stayed for a few months before the three made claims on land two and half miles south of today’s Libertyville. Ransom farmed the land until 1847 when he moved to Waukegan to go into business with his son-in-law. He passed in 1862. Ransom’s brother Richard was one of the three “viewers” appointed by Cook County (the region was part of Cook County until 1836 when it became part of McHenry County and finally Lake County in 1839) to lay out a road from Chicago north to the state line, across the Des Plaines River –the Milwaukee Road. Richard’s son, Albert B. Steele, is said to be the first white child born in what would become Lake County. Richard Steele lived on his Libertyville farm until 1842 when he moved to Manitowoc WI. He would outlive is brother by more than a decade, passing away in 1876. At this time the land along the road on the west side of the river was mostly open prairie, but right at the present site of Libertyville there was a grove of oak trees running back to what is now Butler Lake. An Englishman named George Vardin settled in this grove in 1835, just about where the Ansel B. Cook House is today. That same year William Cooley, Elconah Tingley, and Tobias Wynkoop also made claims on the north side of present day Libertyville. Little is know about George Vardin other than he was “a man of culture” and had a wife and daughter. The family had moved on within the year, but the area became known as Vardin’s Grove after its first settler. Another pioneer, William Cooley, settled on the east side of the road just north of the present Metra railroad crossing. He farmed for a few years and then sold his land to Calvin Appley who came from Connecticut. The land would remain in the Appley family until the 1960s. Near today’s Adler Park, a man named Elconah Tingley took up land. He started a brickyard on the east bank where there was a good clay deposit. His property also provided one of the only fording places along this stretch of the river. Tobias Wynkoop settled north of present day Buckley Road and owned land that extended beyond the Bull Creek. In fact Tobias claimed all the prairie to the west as far as he could see, but he was not able to finance so large a tract even at $1.25 an acre when it came time to pay up and he had to be content with a much smaller farm. In June of 1836, a stage coach line was established along the new Milwaukee Road connecting Chicago to Milwaukee. The newly-established road cut through the fledgling community at Vardin’s Grove, and helped to secure its future as an established town. A month later, on July 4th, 1836, the early settlers of Vardin’s Grove erected a flag pole in a small clearing, and dubbed the community Independence Grove. However, when the new town applied for a post office in 1837, it was found that another Independence Grove already existed in Illinois. Archimedes Wynkoop, nephew of Tobias Wynkoop, suggested the name Libertyville and the petition was granted. Henry Steele, nephew of Ransom and Richard Steele, who had taken up residence in the former Vardin Cabin, was appointed the first postmaster. New arrivals to Vardin’s Grove/Independence Grove/Libertyville in 1836/37 included Dr. William Crane, Horace Butler and Dr. Jesse Haven Foster. Dr. William Crane. Courtesy of the Libertyville-Mundelein Historical Society. Dr. Crane came from Vermont in 1836 and took up a tract of land along the Milwaukee Road near today’s Libertyville Bank and Trust and north to Lake Street. He was a veteran of the War of 1812 and although a physician, he did not practice in this area. Instead, he opened the first hotel/tavern in the village and had business interests in a saw and gristmill in town. After township government was adopted in 1850, he was elected as the first supervisor. One of his daughters married Calvin Appley and one married Horace Butler. Horace Butler. Courtesy of the Libertyville-Mundelein Historical Society. Horace Butler came from New Hampshire in 1837. He was a lawyer and very active in public affairs. He served as a postmaster, Justice of the Peace and Probate Justice. Today’s Butler Lake bears his name as it sat at the west side of his property. From The History of Sutton, New Hampshire, 1890. Dr. Jesse Haven Foster came from Vermont in 1837 and was the first practicing physician in the area. He would purchase “The Grove”, about 18 ½ acres along the Milwaukee Road, the location originally settled by George Vardin. Many years later, Dr. Foster would sell the property to his son-in-law, Ansel B. Cook, who would build the house which sits in the heart of Libertyville today. While the Des Plaines River and other waterways served as guides for early settlers, it would be the crossing of the rivers by the railroad that would lead to significant growth, especially in Libertyville. The Chicago, Milwaukee & St. Paul Railroad ran a line from Chicago to Milwaukee in 1872 – but on the east side of the Des Plaines River. The closest stop to the village was Libertyville Junction – known today as Rondout. By 1879 Libertyville had grown to the point where both businessmen and farmers could see the benefit of a railroad in their community. Colonel E. B. Messer, George Schanck, and Dr. Sam Galloway worked out a deal with the railroad company. The railroad promised to lay tracks into Libertyville and provide one daily trip to Chicago. Libertyville’s side of the bargain was a little more work: they had to acquire the right of way for the tracks to come into town, grade the roadbed, build a bridge across the Des Plaines River, and provide the land for the depot. Des Plaines River Bridge, Libertyville, Ill., c.1900-1909. Courtesy of Libertyville-Mundelein Historical Society. Libertyville got to it and on May 31, 1880, the first train whistle sounded in Libertyville. As expected, the coming of the railroad to Libertyville ushered in a building boom. During the 1880s, subdivisions were opened up, the first Central School, the Presbyterian Church [originally on Orchard Street/West Church Street], two commercial buildings, two mills and lumberyards, and a hotel were built. The population doubled from 221 to 550 people during the decade. Whether as a route of transportation, a navigation guide, a source for natural resources or an obstacle to be overcome, the Des Plaines River played an important part in the lives of these early settlers and their descendants. Carroll, C. E. “The Early Settlers.” Unpublished manuscript on file at the Libertyville-Mundelein Historical Society. Carroll, C. E. “History of Libertyville.” Unpublished manuscript on file at the Libertyville-Mundelein Historical Society. Carroll, C. E. “Roads.” Unpublished manuscript on file at the Libertyville-Mundelein Historical Society. Dretske, Diana. Lake County, Illinois : an Illustrated History. Sarasota: Sun Fung Museum Catalogs & Books, 2007. Dretske, Diana. “Daniel Wright – Lake County’s First Settler. Lake County, Illinois History blog. Accessed February 22, 2017. Halsey, John. A History of Lake County. Philadelphia : R.S. Bates, 1912. “The Kennicott Family.” Chicago Legal News, February 9, 1884, p.179. Google Books, accessed March 2, 2017. The Past and Present of Lake County, Illinois. Chicago, Wm. Le Baron, 1877. Portrait and Biographical Album of Lake County, Illinois. Salem, Mass. : Higginson Book Co., 1997. Facsimile reprint. Originally published: Chicago: Lake City Pub., 1891.